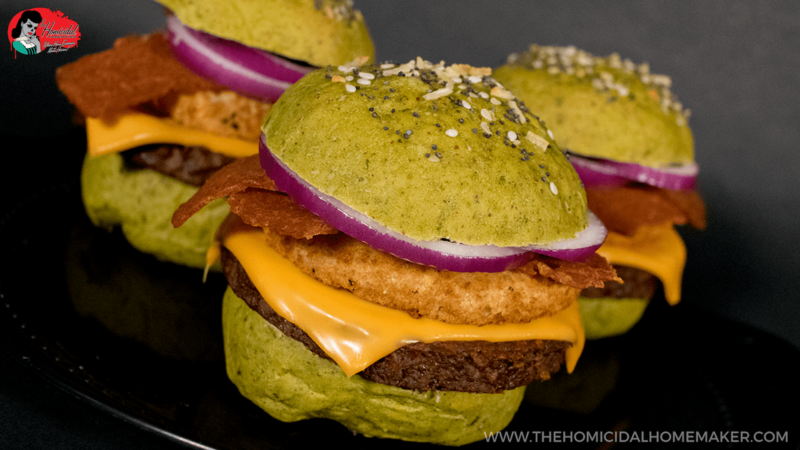 The Nightmare Queen: a Vegan Take on Burger King's Nightmare King! My vegan twist on Burger King's Halloween "Nightmare King" burger! 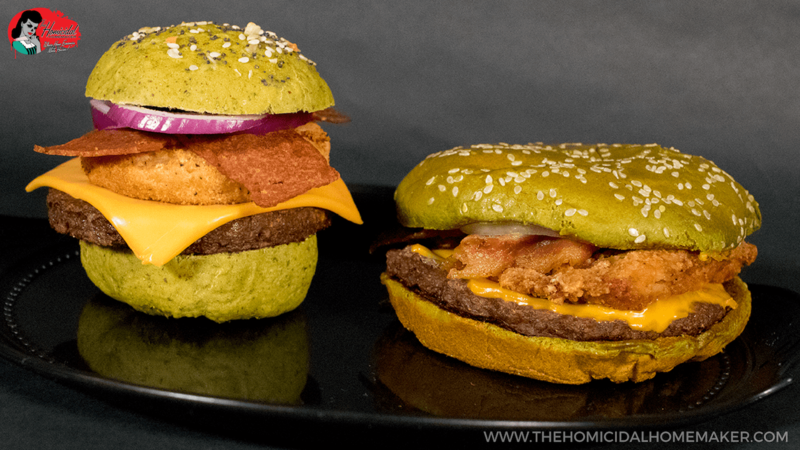 A vegan twist on Burger King’s Halloween Nightmare King burger! It shouldn’t come as any surprise that I’m a sucker for seasonal treats…especially those that seem to crawl out of their crypts during the Halloween season. I’m not just referring to my beloved Monster Cereals or Ghoul-Aid, but also the seasonal treats that theme parks, restaurants, and fast food chains offer during the most wonderful time of the year. I mean…I inhaled a massive Stranger Things doughnut and Demogorgon Totchos (like nachos…but with tots!) at Universal Studios Hollywood’s Halloween Horror Nights, solely because of the theme. So when I saw that Burger King would be debuting their pitch-black Fanta Scary Cherry Freeze and their nightmare-inducing Nightmare King, I knew that I had to make my way over to Burger King. There was only one problem: I’m a vegetarian. Burger King does offer the option of adding a vegan patty to any burger, but I still felt that I wasn’t going to fully experience the monstrosity that is the Nightmare King: a swampy-green-colored bun piled high with a 1/4-lb beef patty, a breaded chicken breast, thick-cut bacon, and dressed with mayonnaise and fresh onions. On top of that, it claims to have nightmare-inducing side effects. You have been warned! 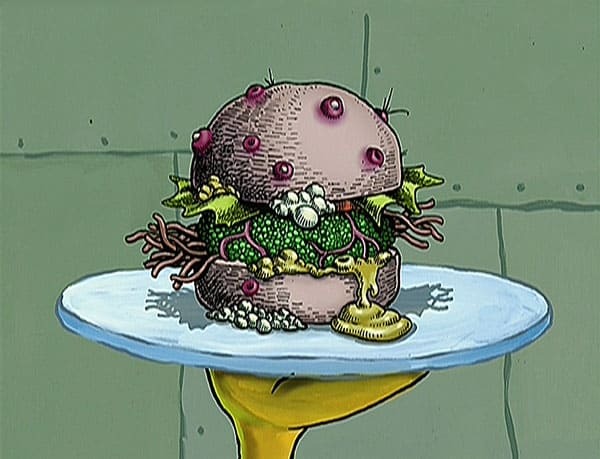 And, hopefully I don’t ruin this for anyone, but it totally reminds me of The Nasty Patty from Spongebob. 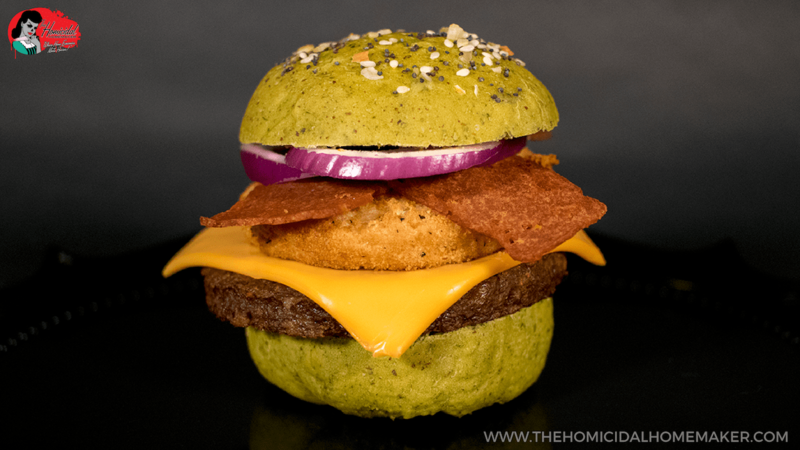 I knew that I had to get over into my lab and create the vegan-friendly version, the Nightmare Queen. 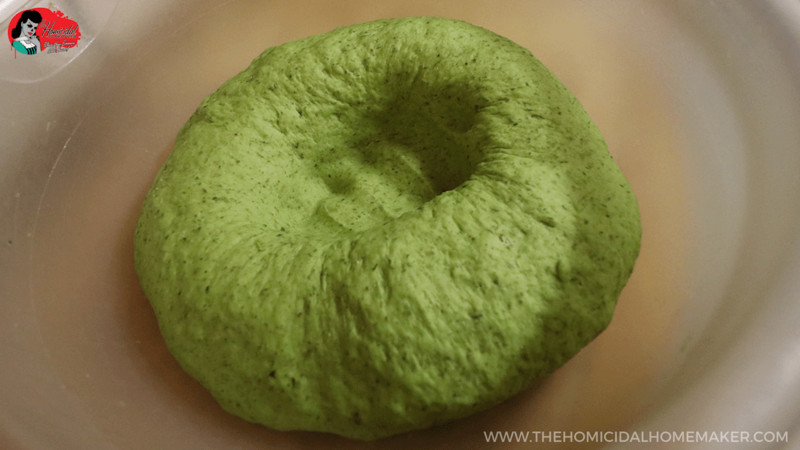 With a naturally-colored green homemade bun topped with my favorite “Everything Bagel” seasoning, my Nightmare Queen is a little different than the Nightmare King it is inspired by, but it’s still oh-so-delicious. The homemade buns are super simple to make, and so soft and yummy! I prefer varying textures and flavors in my food, so I also topped my own serving with red onions, fresh arugula, alfalfa sprouts, and heirloom tomatoes. To really go with the ‘fast food’ route, I’m listing my favorite ready-made frozen products that I used in this particular recipe, as well as my favorite homemade “beefless” burger recipe. If you’d also be interested in my “chickenless” patty recipe, please leave a comment below and I’ll write it up! Either will work just fine, and will be equally delicious. 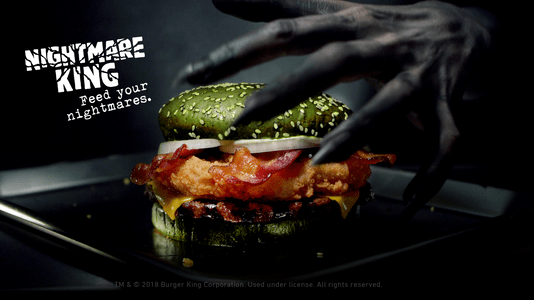 I even went to Burger King on October 22nd, solely to buy the much-anticipated Nightmare King. They said I was the first person to order one! It cost me just under $7 for only the sandwich, which I purchased for photography purposes. My family did split it and said it was quite tasty, and fortunately, they didn’t suffer from any of the “nightmare inducing” side effects that were claimed in the marketing. They also tried my vegan version, which they said was delicious as well. 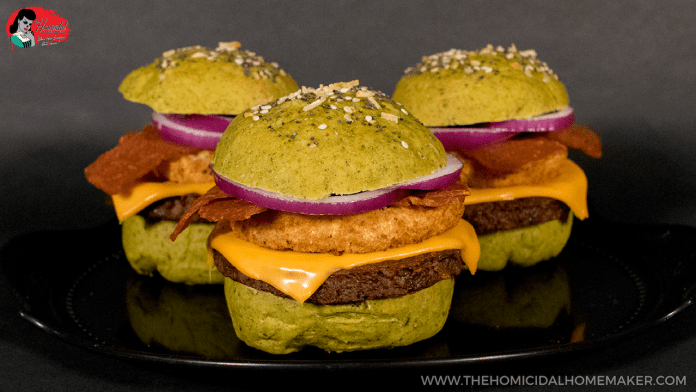 I hope you enjoy my recipe for the Nightmare Queen – my vegan take on Burger King’s Nightmare King! If there are any other seasonal treats or goodies you’d like to see me re-create here on the blog, please be sure to leave a comment below! EDIT 11/14/18: Check it out! Fellow horror YouTuber Vicky aka NightmareMaven made a video giving my vegan Nightmare Queen a try! In a small bowl, combine all ingredients and stir until combined. Store in an air-tight container until ready to use. In a large skillet, add 1/2 Cup water and 3 Cups loosely-packed spinach. Cook for 1-2 minutes, until the spinach has reached a bright green hue. Remove from heat. 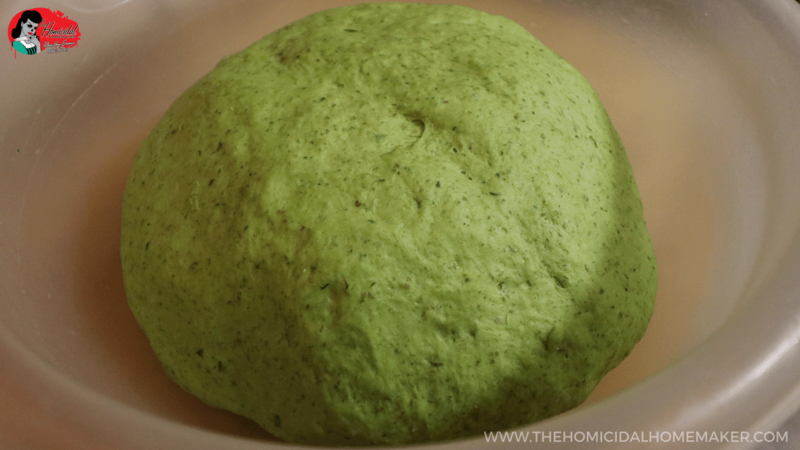 Transfer both the cooked spinach and water to a blender, and process until smooth. Pour the blended mixture into a 1-Cup measuring cup, adding enough warm water to reach 1 Cup of liquid. In a large bowl, whisk the warm spinach-water mixture (it should be around 104F), yeast, sugar and a 1/2 Cup of flour together. Allow to sit for 5-10 minutes, until the yeast has activated and “bloomed”. Then stir in the olive oil, salt, and flax seed. Gradually begin to add the remaining 2.5 Cups of flour, a 1/2-Cup or so at a time. 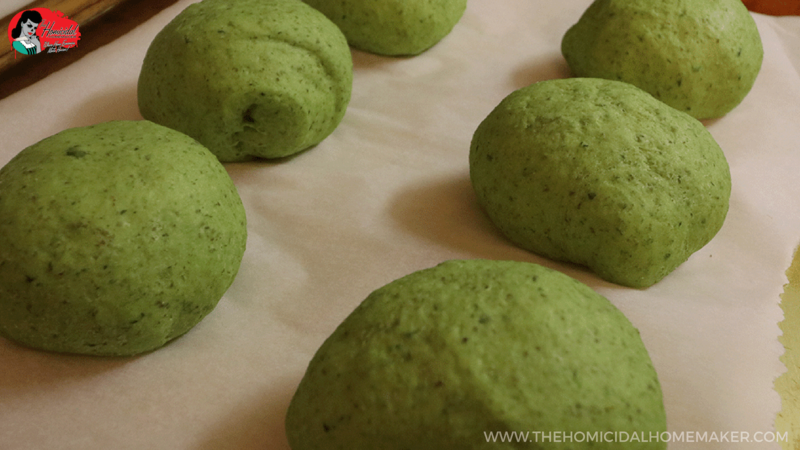 To ensure that the buns turn out super soft, do not add more flour than necessary; you want a doughy consistency that isn’t sticky to the touch. You may or may not need the entire 2.5 Cups of flour. Turn the dough onto a flat surface and knead for 5-10 minutes. If the dough is still too sticky, add a tiny bit more flour. During the kneading process, the dough should become more elastic, with no sticking. In an oiled bowl, allow the dough to rest with a warm damp cloth (or plastic wrap) over the top of the bowl. Place it in a warm location for about 45 minutes or until the dough has doubled in size. Once the dough has doubled in size, give it a good sucker punch right in the middle, and turn it onto a flat kneading surface again. Cut the dough into 8 even pieces. Knead each piece into a round shape, gathering the edges into the center and pinching together. Place them pinched-side down onto a parchment-lined baking sheet. Cover with a warm, damp cloth or plastic wrap, and allow to rest for another 45 minutes, or until the buns have doubled in size. During this last 15 minutes of resting time, preheat your oven to 350F. Remove the cloth or plastic wrap, and brush the tops of the unbaked buns with melted plant-based milk (I used cashew milk) or butter substitute. 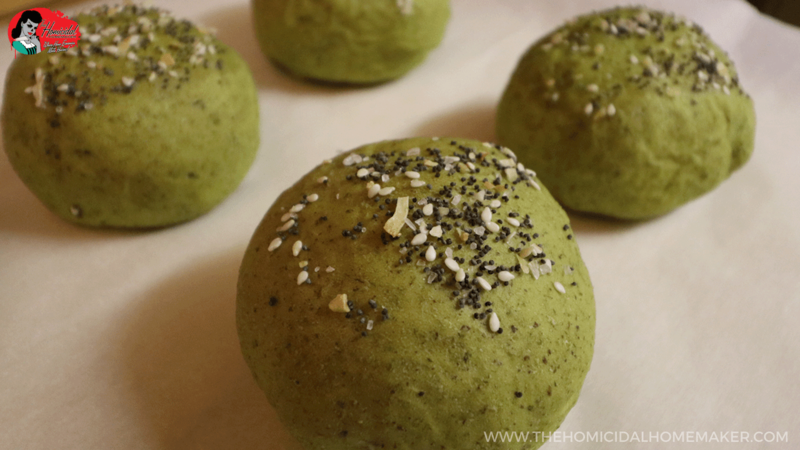 Generously top each bun with the “Everything Bagel” seasoning, or sesame seeds. Bake for approximately 15 minutes, or until just slightly starting to brown. It’s important to not over-bake the buns to ensure they remain soft and delicious. When baked, the buns will have a “hollow” sound when tapped on the bottom. Allow to cool completely before slicing, toasting, and filling with your favorite burger fixings. Prepare the breaded “chicken” patties –I baked mine in my air-fryer for 7 minutes, but baking in a conventional/toaster oven, or pan-frying will work just fine. While the “chicken” patties are baking, lightly pan fry the “bacon” strips and “beef” patties in an oiled skillet. Top each “beef” patty with a slice of cheese. Slice the buns in half; lightly toast in a skillet. If you’re feeling really adventurous, fry the bun with a little mustard, much like In-N-Out’s Animal Style burgers. Add mayonnaise to the cut sides of the buns. Top the bottom bun with the beef patty, and top with a “chicken” patty. Add the “bacon” and sliced onions, and top bun. This is how the actual “Nightmare King” is served. On my own serving, I added some fresh arugula and alfalfa sprouts, sliced heirloom tomatoes, ketchup, mustard, and sliced pickles. In a small saucepan, bring the water to a boil and dissolve the “beef” bouillon cube in it. Place the TVP granules in a bowl and cover them with the broth. Let them sit for about 15 minutes, or until the liquid has absorbed. In a separate bowl, mash the black beans; don’t completely mash them into a paste – leave a few beans intact. Then add in the oats, cornstarch, mushrooms and onions, and mix until combined. Add in the ketchup, Worcestershire sauce, liquid smoke, and seasonings and combine. Add the soaked TVP to the bean mixture and mix until well-combined. Add up to ½ cup of flour, a few Tablespoons at a time until the burger mixture is at a consistency that feels like it will hold together. Cover the bowl and allow the mixture to chill in the refrigerator for at least one hour. When you’re ready to prepare the burgers, remove the mix from the refrigerator and shape into patties using a burger press or round cookie cutter. Add the remaining 1/4 Cup of flour to a plate and lightly coat both sides of each patty in flour before frying. Cook or freeze with pieces of parchment or wax paper in between. To prepare: heat a Tablespoon of oil in a skillet over medium-high heat. Cook the burgers just until browned and lightly crisp on the outside, approximately 5 minutes per side. Serve and enjoy! Previous articlePerfect SCAREamel Apples with Nostalgia Electrics Caramel Apple Party! I showed the picture of the two burgers side-by-side to my omnivore boyfriend, and he said the meat one looked gross! I was actually surprised by how many people had similar sentiments about it! My family said it actually tasted good, but they all enjoyed my vegan version better. I hope you give it a try!